I was taking a class at Yoga Vida with Dominic last week, and he had us start practice by closing our eyes and breathing deeply and evenly. "With each breath in," he said, "think 'I am calm.' And with each breath out, think 'I am happy.'" And after a few minutes of this--of listening to my own breath and the collective deep breathing of everyone in the studio--a calm really did settle over the room. I've thought about this idea of "what you think, you become" off and on for years, but sometimes, I would get annoyed and dismiss it as spiritual fear mongering. I tend to be pretty impressionable and the last thing I need is some concept making me paranoid about every passing thought in my head. But recently, I've started to look at the words in a slightly different way. I think what that phrase means, at it's heart is this: Pay attention to the stories you're telling yourself everyday. What are you thinking about yourself? Is it that you're not good enough, smart enough, attractive enough, ______ enough? Is it a story from your past that just keeps looping? Be careful. Tell those things to yourself enough times, and they're bound to manifest themselves in one way or another. Your thoughts are powerful things. So be kind to yourself and be kind to others. Know that it's okay to be exactly who you are. And when things get a little stressful, just stop for a second. Take a deep breath in. Take a deep breath out. Breath in and think "I am calm." Breath out and think "I am happy." 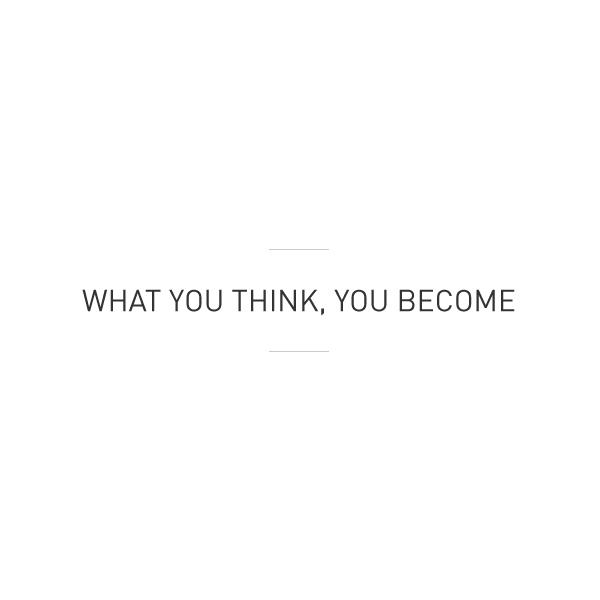 What you think, you become. I love these posts! Thanks for sharing. I absolutely love this and find it to hold so true. There definitely is a power in positive thinking because a lot of times you get back what you put out. Beautiful post. Really good. Thanks for spreading! look at my Monday Inspiration post...i want more! Apa Penyebab Kanker Usus Besar? Apa Saja Gejala Kanker Usus Besar?